How visible is India’s air pollution? Much too visible, according to Astronaut Scott Kelly, who is finishing up his year onboard the International Space Station. On January 12th, Kelly posted the following picture, which shows northern Uttar Pradesh on the left, and the Himalayas and Nepal on the right. 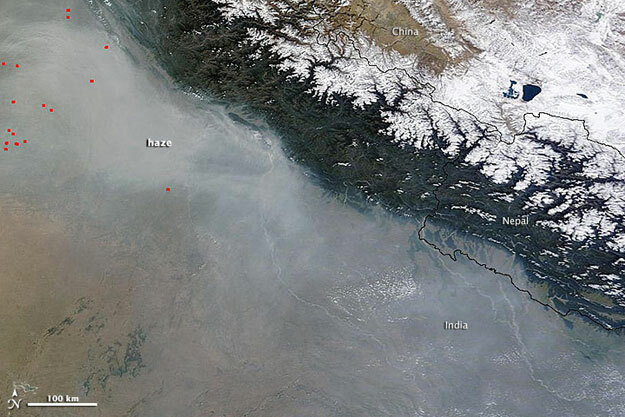 In December 2014, NASA released a similar picture highlighting the difference in pollution between India and Nepal. The pictures get part of the story right. Pollution in North India may be much higher than pollution in northern Nepal. 13 of the 20 most polluted cities in the world are in India, with a large majority in northern India. Though northern Nepal may have better air quality due to the Himalayas, Nepal as a whole may not be significantly better. Yale’s Environmental Performance Index, which compares air quality among 181 countries, ranked India at 178 and Nepal at 177 – both among the lowest in the world. Nepal’s low rankings may stem from Kathmandu Valley, whose bowl-shaped topography traps warm, polluted air along with dust and smog. Though the government-installed air monitoring devices in Nepal have been out of order since 2007, a Yale graduate student, Anobha Gurung, conducted PM 2.5 tests in 2009. She found that in certain urban areas, traffic police were exposed to over 500 ug/m3 of PM 2.5 per hour – that’s over 200 times the World Health Organization’s recommended level of 25 ug/m3! So overall, is Nepal’s air quality that much better than India as the pictures suggest? Though northern Uttar Pradesh may be worse off than northern Nepal, it’s hard to say. The limited data of Kathmandu and northern Indian cities suggests people may be breathing similar levels of pollution, but we won’t really know until those air monitoring devices in Nepal start working again! Bhumi spent several years working with small-holder farmers in India, Kenya, and Sierra Leone. She recently returned to India to work on governance reforms. She helps Smart Air with social media outreach, grant proposals, and anything else that comes along. How bad is the air quality in Kathmandu? How’s the Air in Nepal? Exactly how much does Diwali harm Delhi’s air?